Carbon atoms are important to be classified in a given alkane to differentiate them from one another. Associated hydrogen atoms are also identified based on the corresponding carbon atoms. normal: straight-chain compounds are considered normal and abbreviated to n-. iso: compounds containing (CH3)2CH- grouping is known as iso-compound, abbreviated to i-. neo: compounds with quaternary carbons are known as neo-compounds. 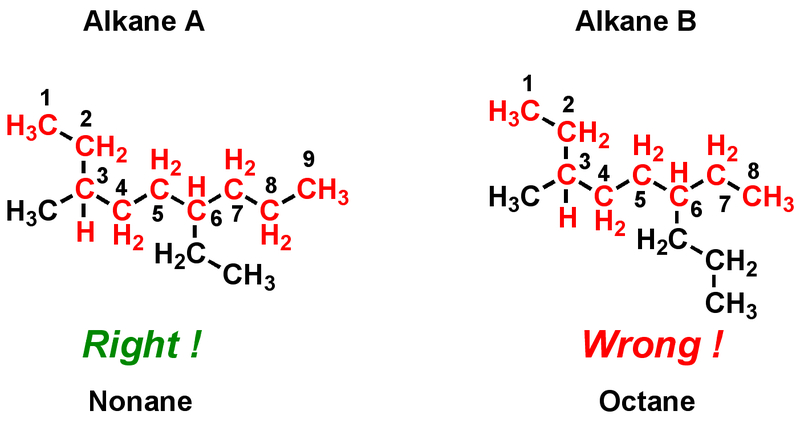 alkyl: univalent groups that are formed by the removal of one hydrogen atom from an alkane are known as alkyl groups. amyl: pentyl groups (-C5H11) are also known as amyl groups. The first 4 alkanes (i.e., methane, ethane, propane and butane) have got the special names historically but the alkanes from pentane onwards are named according to the latin or greek numerals to indicate the number of carbon atoms. However, this naming system becomes very hard to apply for numerous isomers of higher alkanes. International Union of Pure and Applied Chemistry1has formulated general rules for nomenclature of organic compounds.2 Systematic names of chemicals should contain 4 essential parts.3 Michigan State University has a nice virtual textbook on organic chemistry which you can follow to learn more. We have borrowed the rules from there to explain further. Find and name the longest continuous carbon chain. Use this name as the parent name of the molecule. As we are dealing with alkanes, the suffix will always have “ane” at the end. A sample problem below will make it easier to understand. [stextbox id=”info” caption=”Sample problem 1″]Find the parent name of the alkane A. What is wrong with finding the longest continuous carbon chain in alkane B? Alkane A has 9 carbon atoms in the longest continuous chain with a substituent on carbon numbers 3 and 6. Therefore, alkane A has the parent name of “nonane”. If there are two or more longest chains of equal length, the one having the largest number of substituents is chosen. The alkane shown in the figure 4 has 10 carbon atoms in the longest continuous chain counting from both branches at carbon number 5. However, the green branch has 2 more substituents at carbon number 3 and 4. According to the subrule under rule 1 of IUPAC, the branch with more substituents should be chosen. Therefore, the longest continuous chain chosen in this case is the branch highlighted in green color. Figure 5 shows an alkane which has a longest continuous chain of 10 carbon atoms. Now, the question is where to start the numbering. IUPAC second rule tells us to start numbering from the end where we first meet a substituent. Hence, the green way is the right way to number the carbon atoms. Begin numbering at the end nearest a third substituent, if one is present. Begin numbering at the end nearest the first cited group (alphabetical order). In case you encounter substituents equidistant from both ends of the longest continuous chain of carbon atoms, the third substituent can now play a crucial role. According to IUPAC subrule 2a, we have to start numbering from the end nearest to this third substituent. 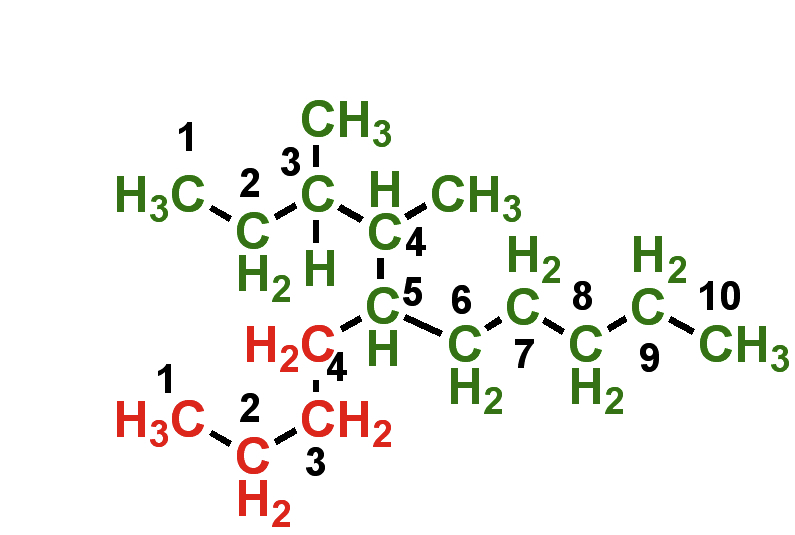 In figure 6, the methyl group, highlighted in red, is nearest to the right end of the molecule as drawn. Therefore, the carbon atom attached to it should get the number 4 and not 6. If the methyl group highlighted in red were not there, both ends would be equivalent. Now, let’s see what happens if we have substituents equidistant from both ends but the substituents differ from each other. A sample problem would make things easier to understand. [stextbox id=”info” caption=”Sample problem 2″] How do you start numbering the longest continuous chain of carbon atoms in the following example? Hint: IUPAC subrule 2b may help. Designate the location of each substituent group by an appropriate number and name. In this page, we are discussing only about alkanes and therefore we have only alkyl groups as the primary functional groups. The example in figure 8 shows how we should assign the numbers of the substituents. Notice, we are also following the rules 1 and 2. 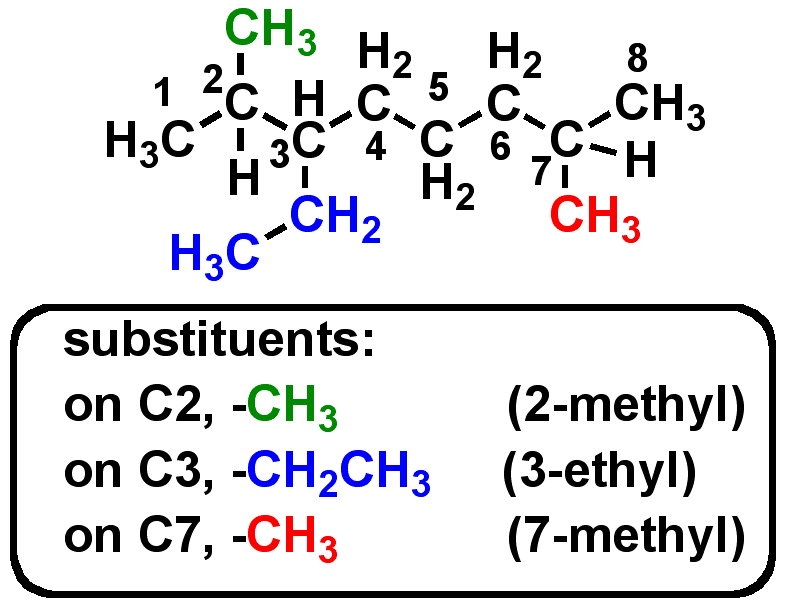 Although, we have substituents equidistant from both the ends, we chose to assign the “green” methyl group the number 2 and the “red” methyl group the number 7 because we have a third substituent at carbon number 3 (ethyl) nearest to the end from where we started numbering the longest continuous carbon chain. [stextbox id=”info” caption=”Sample problem 3″]Assign numbers for the substituents on the alkane shown below. The longest continuous carbon chain is highlighted in green and the only substituents are the methyl groups at carbon number 3. We have to use as many numbers as there are substituents. So, we have to name both the methyl groups. As they are both on carbon number 3, they are both given the name 3-methyl. To combine the two we can then call the substituents as 3,3-dimethyl. Assemble the name, listing groups in alphabetical order using the full name. Two or more substituents are cited in alphabetical orders. The prefixes di, tri, tetra etc., used to designate several groups of the same kind, are not considered when alphabetizing. Hyphens are used to separate various prefixes and commas are used to separate numbers. [stextbox id=”info” caption=”Sample problem 4″]Use all the rules to name the alkanes discussed in this page so far. The solutions are given below. Try to apply all the rules to find out the systematic names of these molecules. Notice that while arranging the prefixes in alphabetical manner, prefixes such as di/tri are not considered for alphabetizing. Check out the Khan Academy videos to learn more. Check out the wikibook on alkanes.